Chesterfield has welcomed its 376th mayor, with Councillor Steve Brunt taking up the reins for the coming year. The new Mayor was sworn in at Chesterfield Borough Council's annual council meeting yesterday evening (Wednesday 11th May). Councillor Brunt was elected as a Labour member serving Brockwell ward at the local elections in May 2015. He had previously served as a ward councillor for Holmebrook ward serving from 1987 to 1999. He worked in mining before a career in further education, retiring from Northern College in Barnsley after 21 years last summer. His wife, Jill Mannion-Brunt, who will serve as Mayoress, will support him in the role. Before proceedings started, Huw Bowen, Chief Exectutive Officer of Chesterfield Borough Council led tributes to former Councillor Pat Proctor, who had sadly passed away at the weekend before leading the chamber in a minute's silence. Leader of The Council, Councillor John Burrows then proposed the motion to appoint the Mayor into the post for 2016/17, describing the chance as a "personal pleasure" having known His Worship for a number of years. He added that Councillor Brunt had been known as a "Hundred-percenter during his time as a miner, on strike from day one to the day the strike finished", before paying tribute to his qualities as a hardworking family man. Councillor Burrows also drew laughter as he described the new Mayor's sporting prowess - a keen runner, he has completed marathons in respectable times, prompting the leader to joke that "Only two months ago, he had taken part in the Bolsover 10k, luckily he got back in yesterday just in time for this!" 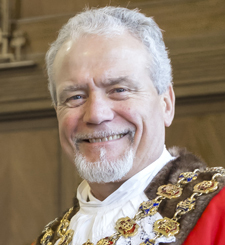 Seconding the motion, Councillor John Dickinson said that he was honoured, "To play a small part in electing the 376th Mayor of Chesterfield", adding that, "Steve and Jill will make a formidable team together. It will be a memorable year!" Addressing the chamber at the start of his year, Councillor Brunt (left), said, "Jill and I are committed to helping people fulfill their full potential. 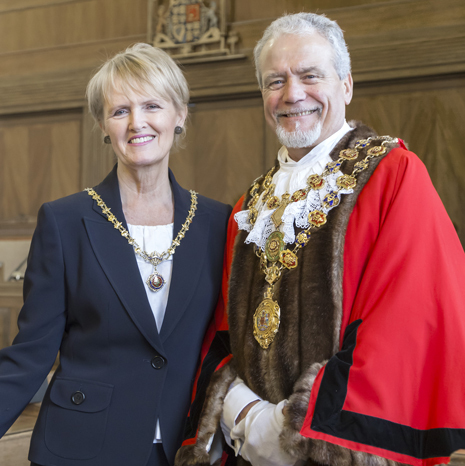 Thank you for electing me as Mayor - the Mayoress and I are looking forward to the year ahead. "This is such an honour for us. Chesterfield has such a history and is a great place for people to live and work. "I will do my best to represent this historic town and fulfil the role of Mayor proudly." Residents are invited to attend the civic service at St Mary and All Saints' Church (the Crooked Spire), on Saturday 14th May from 11am. The service will be led by the Mayor's Chaplain and the church's incumbent, Revd Patrick Coleman in the presence of Rt Revd Dr Alistair Redfern, the Bishop of Derby. There will be a civic procession from the Town Hall to the church and anyone attending the service is asked to be seated for 10.40am before the procession arrives at the church. The service will be followed by a further procession from the church to the Town Hall. There is likely to be congestion in the town centre and the car parks around the Town Hall will also be closed until after the service. Accessible Derbyshire, see www.accessiblederbyshire.org for more details. Councillor Brunt and Mrs Mannion-Brunt replace Councillor Barry Bingham and his wife June who served as Chesterfield's Mayor and Mayoress in 2015/16.